For the short story, see His Last Bow (short story). Not to be confused with His Last Vow. His Last Bow: Some Reminiscences of Sherlock Holmes is a collection of previously published Sherlock Holmes stories by Arthur Conan Doyle, including the titular short story, "His Last Bow. The War Service of Sherlock Holmes" (1917). 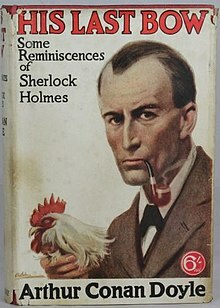 The collection's first US edition adjusts the anthology's subtitle to Some Later Reminiscences of Sherlock Holmes. All editions contain a brief preface, by "John H. Watson, M.D. ", that assures readers that as of the date of publication (1917), Holmes is long retired from his profession of detective but is still alive and well, albeit suffering from a touch of rheumatism. The collection contains "The Adventure of the Cardboard Box", which was also included in the first edition of in The Memoirs of Sherlock Holmes (1894) but was dropped from later editions of that book. Six of the stories were published in The Strand Magazine between September 1908 and December 1913. The Strand published "The Adventure of Wistaria Lodge" as "A Reminiscence of Sherlock Holmes" and divided it into two parts, called "The Singular Experience of Mr. John Scott Eccles" and "The Tiger of San Pedro". Later printings of His Last Bow correct Wistaria to Wisteria. The final story, "His Last Bow. The War Service of Sherlock Holmes" (1917), an epilogue about Holmes' war service, was first published in Collier's on 22 September 1917—one month before the book's premiere on 22 October. His Last Bow was adapted for BBC Radio 4 in 1993–4 as part of Bert Coules' complete radio adaptation of the canon, starring Clive Merrison as Holmes and Michael Williams as Watson. Notable guest stars included Kevin Whately as Browner in "The Cardboard Box" and Edward Petherbridge as Culverton Smith in "The Dying Detective". The episodes were written by Bert Coules, Roger Danes, Peter Ling, and Robert Forrest, and directed by Enyd Williams and Patrick Rayner. ^ a b "His Last Bow". De Encyclopédie de Conan Doyle & Sherlock Holmes. Société Sherlock Holmes de France. Retrieved 21 January 2014. ^ a b "His Last Bow: Some Reminiscences of Sherlock Holmes". De Encyclopédie de Conan Doyle & Sherlock Holmes. Société Sherlock Holmes de France. Retrieved 21 January 2014. ^ Doyle, Arthur Conan (October 1979). The Sherlock Holmes Omnibus (2nd illustrated ed.). John Murray. ISBN 071953691X. ^ Bert Coules. "His Last Bow". The BBC complete audio Sherlock Holmes. Retrieved 12 December 2016. First edition dustjacket image courtesy of Lucius Books Ltd.
Wikimedia Commons has media related to His Last Bow. "The Adventure of Wisteria Lodge"
"The Adventure of the Cardboard Box"
"The Adventure of the Red Circle"
"The Adventure of the Bruce-Partington Plans"
"The Adventure of the Dying Detective"
"The Disappearance of Lady Frances Carfax"
"The Adventure of the Devil's Foot"
This page was last edited on 30 March 2019, at 05:47 (UTC).